By combining Wireless G connectivity, Pan/Tilt/Zoom, audio monitoring and motion detection, the DCS-5300G provides you with the ability to remotely monitor your home or office with ease. 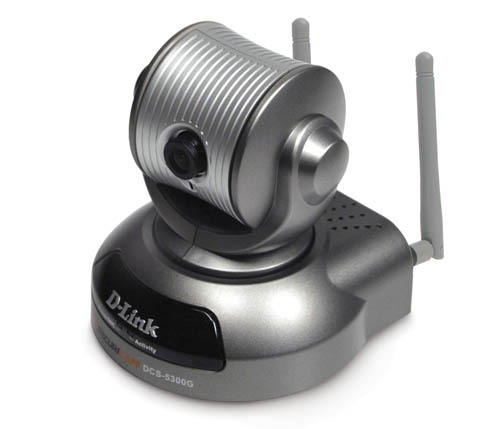 Remotely watch and listen with the D-Link SECURICAM Network™ DCS-5300G Internet Security Camera. The DCS-5300G is a fully-featured surveillance system that connects to an Ethernet or wireless broadband network to provide remote high-quality video and audio. Using the latest 802.11g wireless technology, the DCS-5300G securely communicates at a maximum wireless signal of up to 54Mbps*. You can safely access and control the DCS-5300G using Internet Explorer version 6. Watch and listen remotely as the DCS-5300G captures both sound and video of your site. The DCS-5300G Wireless Security Camera uses a CCD sensor that provides sharp and clear video with lifelike color representation. The DCS-5300G Wireless Security Camera has a pan, tilt, and zoom function that can be controlled from the Web interface or from the included remote control. Pan the security camera up to 270 degrees horizontally and tilt it up to 90 degrees vertically. The pan/tilt speed can be adjusted to your preference. 4x digital zoom** lets you remotely zoom in on all the action for close-up viewing. The DCS-5300G adheres to the Universal Plug & Play (UPnP™) specification which allows computers running Windows® XP/Me to automatically recognize the DCS-5300G and add it to your network. The DCS-5300G Wireless Security Camera can be accessed and viewed from “My Network Places” as a device on the network. By signing up with one of the many free Dynamic DNS services available on the Web, you can assign an easy-to-remember name and domain to the camera (e.g. www.mycamera.myddns.com). This allows you to remotely access your security camera without having to remember the IP address, even if it has been changed by your Internet Service Provider. Everything needed to get started is included with the DCS-5300G Wireless Security Camera. Simple installation procedures, along with the built-in Web-based interface offer easy integration into your network environment. Powerful surveillance software is included to enhance the monitoring and security management of the DCS-5300G. You can record high quality video to your hard drive using MPEG4 compression, playback video, monitor as many as 16 cameras on a single screen, and set up motion detection to trigger automatic recording and e-mail alerts. The DCS-5300G Wireless Security Camera is a cost-effective and versatile security solution for your home or business. The DCS-5300G Wireless Security Camera comes with detachable antennas with reverse SMA connectors. By simply attaching a D-Link wireless antenna, you can increase the wireless range of the DCS-5300G. ** 4x digital zoom enlarges an image by magnifying the pixels in a selected portion of the image by 4 times.  Electronic shutter: 1/60~1/15000 sec. * 4x digital zoom enlarges an image by magnifying the pixels in a selected portion of the image by 4 times.